This is not only a intergrated amplifier for CD Player, but also it is a Phono LP MM stage + intergrated amplifier for phono player. 1. Pure manual point-to-point soldering circuit, durable. 2. Made of Japanese Z11 silicon steel sheet as EI power transformer and output transformer, ensuring good stability and musical performance. 3. Use a special KT90 Class A circuit to output dual-channel 18W, electronic tube rectification, to ensure a high degree of reproduction of the amplified tone, beautiful and pleasant. 4. 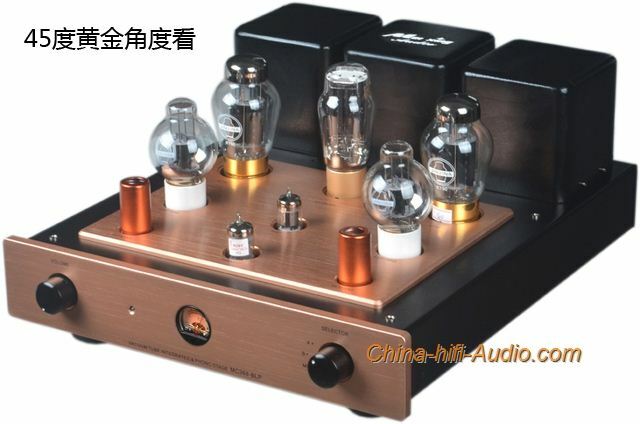 A dual-purpose machine, is not only an excellent Class A amplifier, but also a high-quality phono amplifier, from the turntable audio input to the power amplifier to directly drive the speakers, a machine to complete. Convenient and practical, cost-effective. 5. Phono LP (mm) sings the effect: The sound field is vivid, the resolution is clear, the harmonics are rich, and the bottomless noise is.